Unsplash / Nathália BarianiYounger doesn’t necessarily mean happier. There’s no end to the research that looks into when we will be happiest in life. Everyone wants to be happy, and the pursuit of it seems to be the ultimate goal for a lot of us. 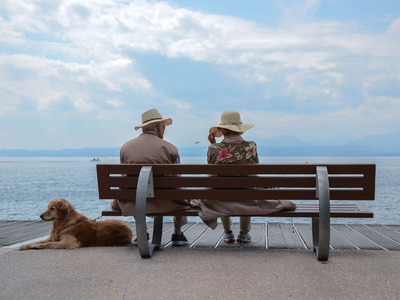 However, while you may assume the prime of your life will occur in your 20s or 30s, this might not actually be the case — while emphasis is often given to the younger years, you might have a bit longer to wait to really be happiest. The Independent reported that a survey by a financial services company found that those over 50 are happier, wealthier, and more carefree than ever. The study surveyed over 50,000 people aged 50 and over, and the general consensus of the fifty-somethings was they felt four years youngerphysically and ten years younger mentally than their actual age. This concept has led to the emergence of the phrase “nifty 50s.” It encompasses the age group who are responsible for leisure centres and activity groups becoming a booming industry again when they retire and take up new hobbies. According to the survey, over half of the over-50 respondents had been travelling since they’d turned 50, 20% planned to learn a new language, and 10% wanted to learn a musical instrument. Overall, 61% said they were enjoying life more because they had more free time to fill with these activities. This isn’t the first time research has shown getting older could also mean getting happier. In 2016, research from the Office for National Statistics concluded the most joyful age bracket was 65-79. The survey looked at more than 300,000 adults across the UK and found life satisfaction peaked at that age before declining over 80. However, those in their 40s — just before hitting the golden age range — were shown to be less happy with the highest levels of anxiety. One possible reason given was that people at this age often have to care for elderly parents as well as being parents themselves, which can be an emotionally exhausting experience. In a blog post on Psychology Today, Dr. Romeo Vitelli says that happiness can be a tricky thing to define. It can mean the kind of joy that only occurs at key moments in our lives, or it can simply be the amount of positive emotion we happen to feel at any given time. However, there does appear to be an upswing as we get older. The Midlife in the United Status research project found happiness was relatively stable for people in their mid-20s to late 30s, then it declined during the 40s and slowly rose to a peak from 60 to 69 years old. Of course, it’s all relative, and there isn’t a set rule to how happy you will be at certain times in your life. However, it is comforting to know you may gain more satisfaction and well-being as you get older and approach those looming milestones. Maybe 60 really is the new 40.